There comes a time in the life of an intrepid adventurer when trekking through the same groups of caves ad infinitum starts to lose its sheen. What was that? Hannah is itching for a new adventure in a faraway land? Well, she's got her wish! 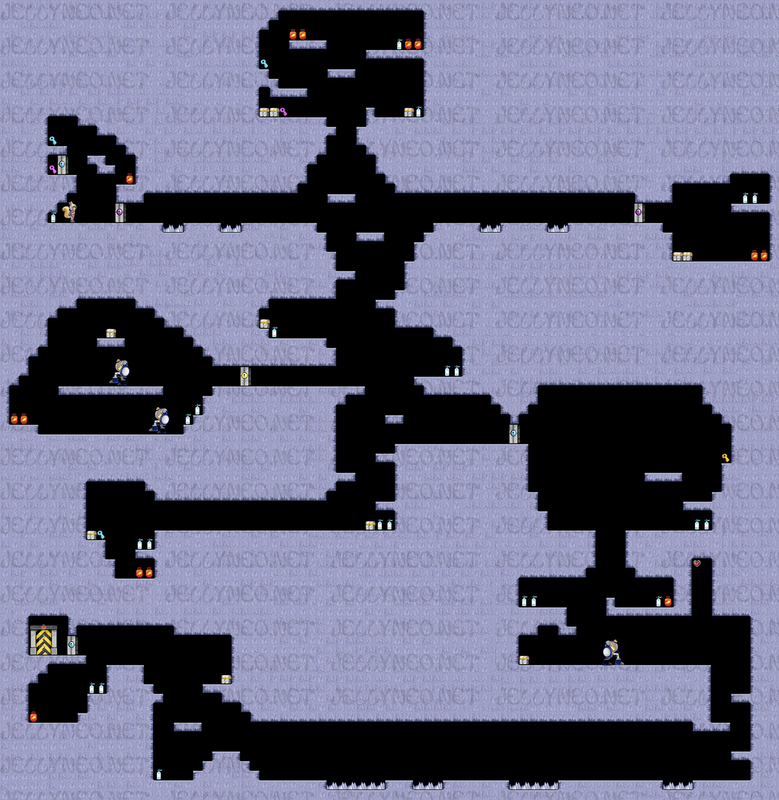 For those who have played Hannah's previous adventures in the Ice and Pirate Caves, Hannah and the Kreludor Caves works in much the same fashion. (Hannah is on her own this time around, so no Armin to drag along!) 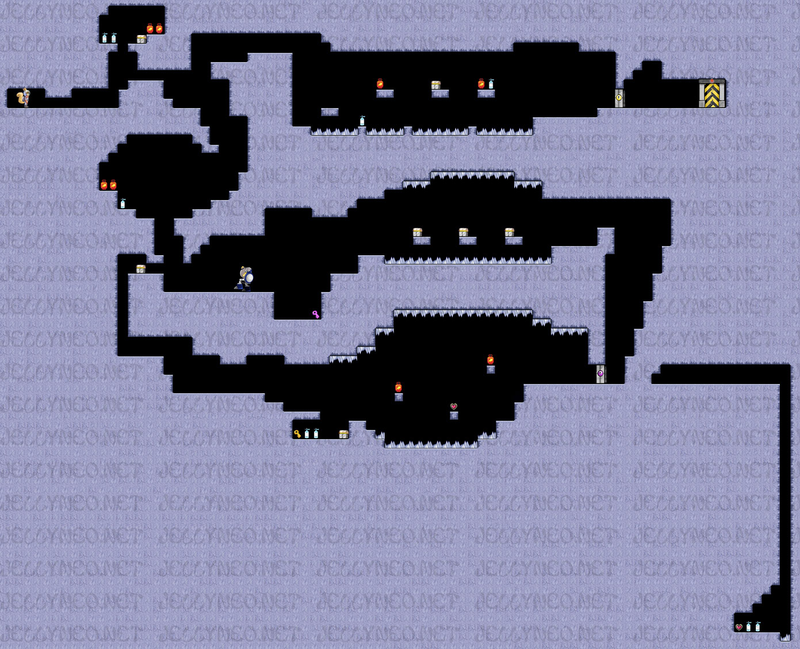 It's a fairly standard platform game with boosters and hazards galore. The bottom two gauges indicate Hannah's reserves of fuel and oxygen, respectively. 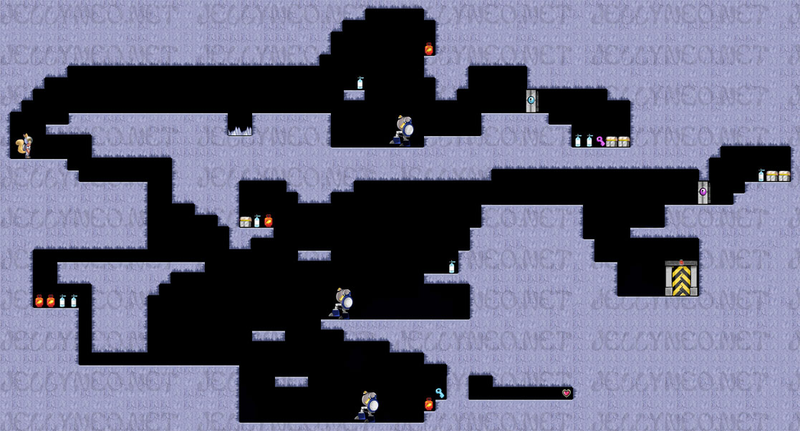 While the game has no timer as such, Hannah's oxygen reserves will slowly decrease during the course of the level and, if the player doesn't pick up extra bottles, Hannah will die and the level will end. The following keys control Hannah's movements around the map. To crawl left or right, for example, one would hold down the 'crawl' and 'right' keys at the same time; that is, 'down arrow' and 'right arrow'. The same applies for jumping, just like the Ice and Pirate Caves games. Like any good platform game gallant adventure, there are plenty of things for Hannah to find on her travels. Some may help, while others may hinder. Tip: If you're running low on rocket fuel, pressing the up button or spacebar once and then pressing the left or right keys will ensure you don't use any fuel. Pressing the up button or spacebar once Hannah is in the air means you will use some of your fuel. Level 1Jump up to reach the booster and the blue key. You won't need the jetpack for that; make sure not to hold down the up arrow or spacebar. Use the down key to crawl through the narrow passageway at the bottom and be careful of the spikes! Level 2Make sure you press the up key just before reaching the end of that first drop, as otherwise you will lose a life. 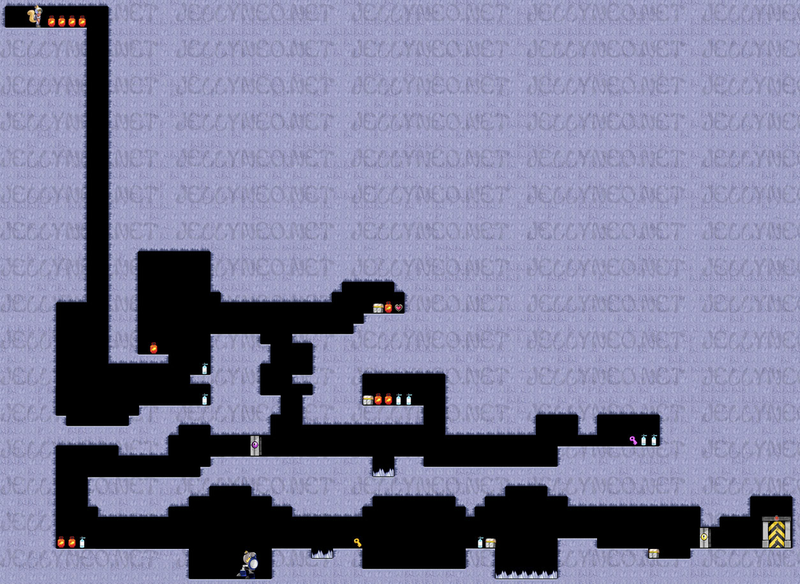 The boss monster at the bottom should be jumped over, don't try to fight it! Be sure to explore every corner of this level. Level 3The seemingly 'hidden' goodies at top-left are actually easy to obtain; simply walk through the wall! 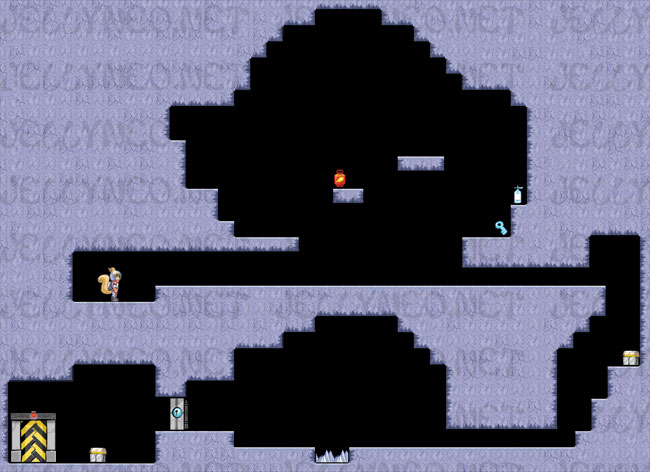 As for the keys at the bottom, for quickest results jump on the platforms in this order: middle, bottom, top, middle, bottom, top, at which point you collect the treasure chests hidden at the top. 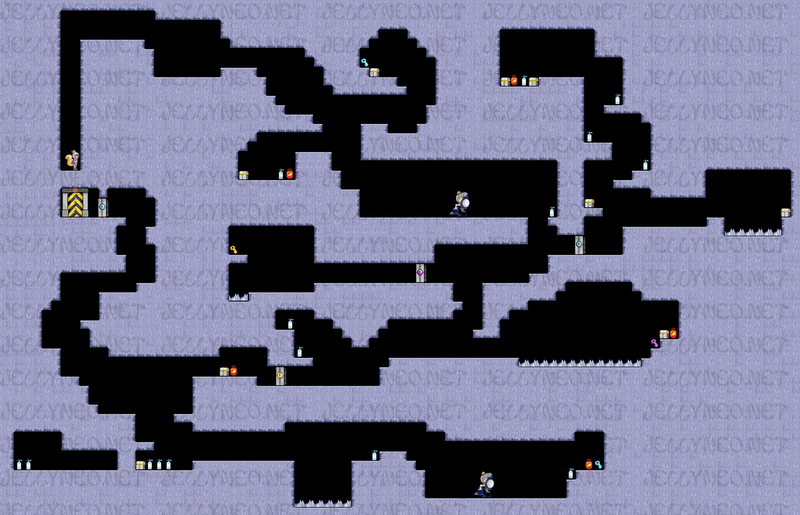 You'll need to crawl under the spikes to get the extra life at the bottom-left of the map. Level 4Yes, there is a way of navigating that huge jump at the beginning! Get a running start and jump as high as you can; at your highest point, hit the fuel for a second, then release for a second. Hold it down a bit longer, release for a second, and then hold it down for the rest of your jump. You should reach the middle platform with a tiny bit to spare, at which point you can collect additional fuel tanks. 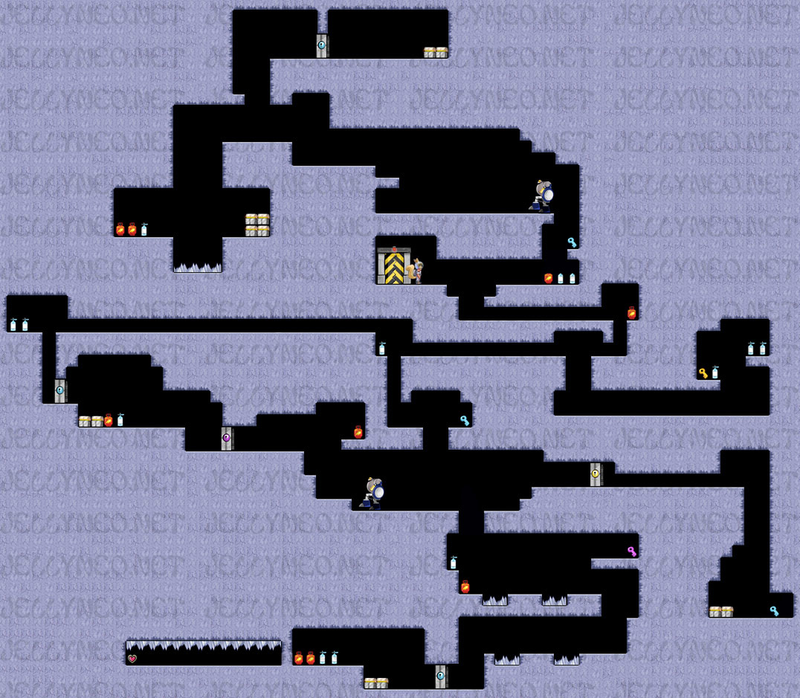 After that, the level is fairly simple. Level 5Though it seems a long way to go, you'll have to venture all the way to the bottom for that blue key and back up again to get the two treasure chests behind the blue door, and then all the way along for the magenta door. Careful of the bosses, as Hannah cannot hurt them. 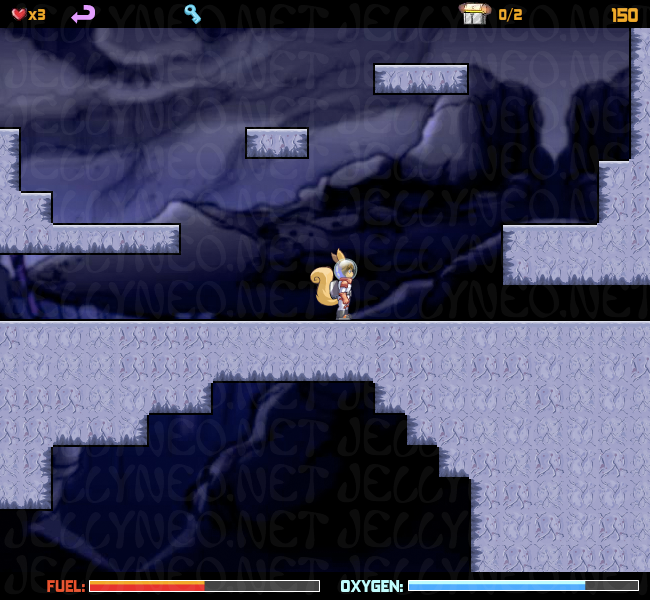 Also keep an eye on your oxygen in this level. 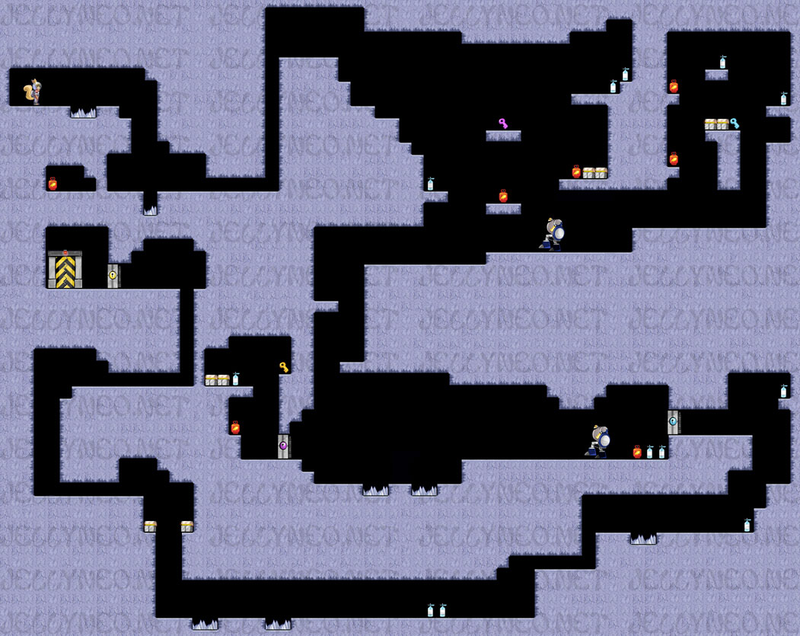 Level 6A relatively simple level, as long as you follow the map - be sure to grab every oxygen bottle, you're gonna need them! Level 7See that treasure chest on the middle-left, near the boss? You'll have to go clockwise all the way around to retrieve it. Be careful with your oxygen supplies - though it is possible to reach that hidden part on the bottom-right and have enough fuel, you may feel it isn't worth the oxygen. Precision is key! Level 8The jump over the spikes on the lower-right may prove difficult. Be sure to use the same technique you picked up in level four - press the fuel button a few times on your descent, rather than holding it down. This is a long level, so use your oxygen wisely! Level 9This level is harder than it looks - if Hannah falls from too great a height, she'll lose a life! Tapping the fuel button when the yellow exclamation mark appears (!) will slow her fall. Make the most of your fuel by waiting until you're at the peak of a jump to press the fuel button. Level 10You may wish to complete the upper portion of the level before heading down and back up again - those bosses can catch you unawares. Make sure to crawl to the heart at the very bottom - standing up will hit Hannah's head on the spikes and you'll lose a life. Level 11Go up to collect keys, then across to open doors. You'll need to go down mid-right to collect the yellow key, and back to the left again to open the door. Don't be tempted by that hatch at the bottom! As always, oxygen is essential - dawdling will cost you. 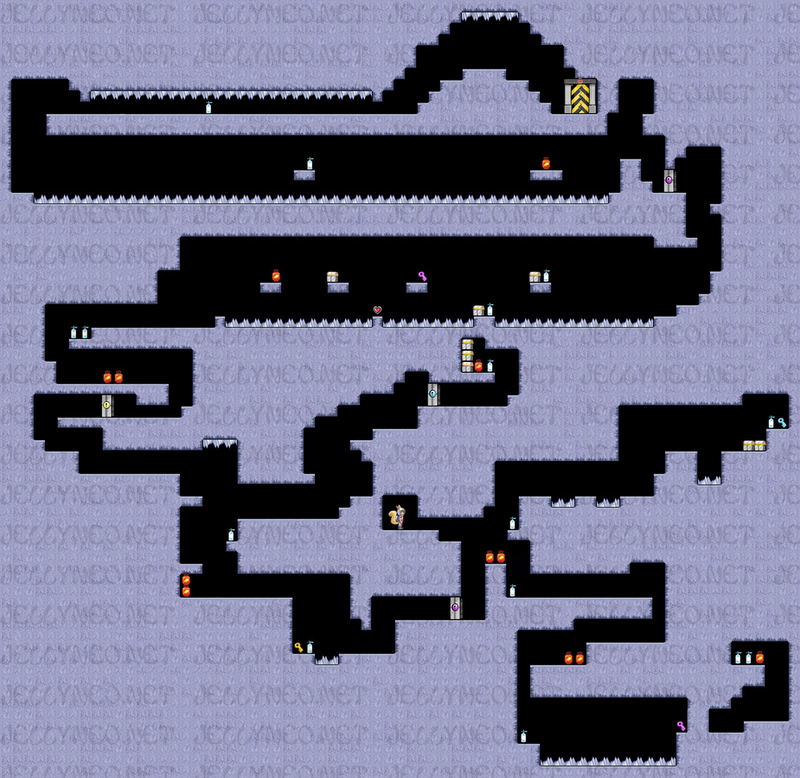 Level 12From the starting point, go right to collect keys and bonus items (which you will need to use wisely). The long jump at the end is like the one at the start of level four; remember to get as much of a running start as you can, and once you reach the peak of the jump press and release the fuel button a couple of times before holding to the end. You must crouch (down key) for the last portion with the spikes above. Don't look up! Level 13See that hugely long shaft on the right? You can try going that way if you like - but if you don't do it right, you'll run out of fuel partway through and will have no cushion to save Hannah on that last fall. To save fuel, backtrack along the bottom and left before flying up. Both ways are possible, but no matter which one you choose, you'll end up with next to no fuel at the end. Naturally, fuel economy is essential in this level - only fly when you have to, and make sure to jump without fuel as often as possible. Level 14There are no oxygen bottles in this entire level. Nope. Nada. None at all. Which means speed is absolutely essential. You can save time by not landing to pick up fuel bottles, as landing chews up oxygen - simply fly close enough by them, and you'll pick them up. Your oxygen will last exactly one minute and twenty-five seconds. Make the most of it! Level 15There's a secret passageway at the start between those two ledges, from the ninety-degree corner to the other side with one fuel and two oxygen tanks - you'll fall out of the passageway directly above that ledge. You don't have much fuel at the start - if you don't use this passageway, you may well get stuck where the purple key is a little further down. 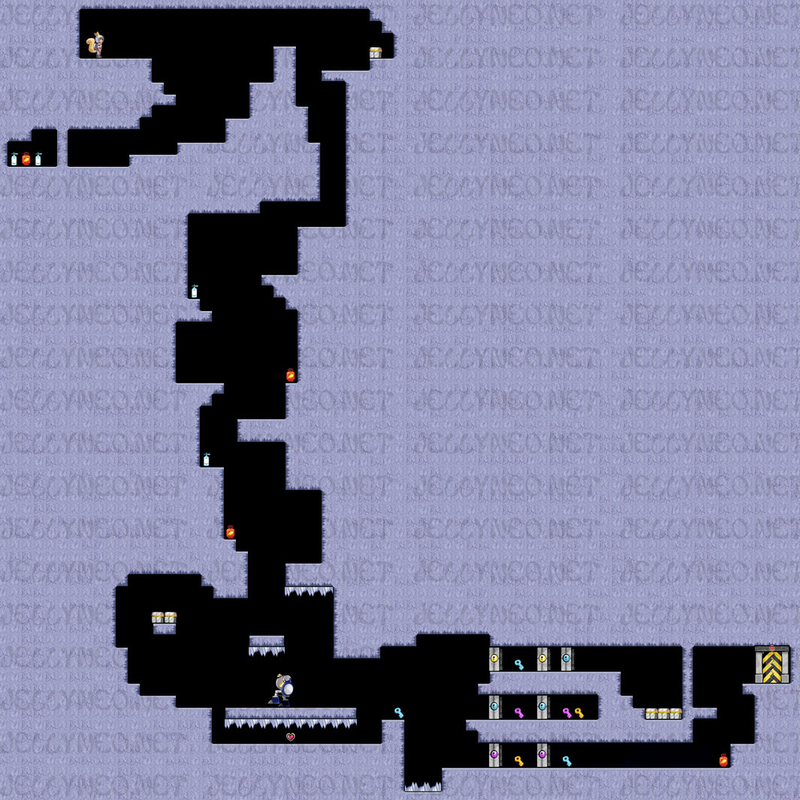 As befits the last level, this one is extremely long and finicky. Make sure to collect the keys to the right of the starting point before descending. The hardest part (though your mileage may vary) is the three bosses at the end. You will need to jump between them to collect the three yellow keys. Timing is critical! If you're serious about wanting a trophy for Hannah and the Kreludor Caves, you're not likely to get it just for playing through all the levels--instead, you'll need to repeat some of the lower (high-point and low-difficulty) levels. There's a very easy way to do this: before you start the next level, you have the option to go back and repeat an old one. Thus, you can play the first couple of levels over and over again to your heart's content until you've got the score you need. Thanks to Mcneillyf for reminding us!